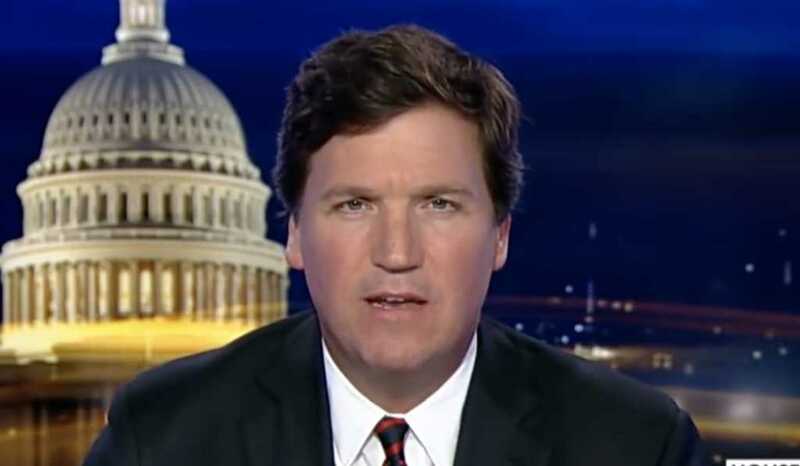 The home of Fox News host Tucker Carlson was targeted Wednesday night by an angry mob of liberal protesters who hurled themselves at the commentator’s front door, ultimately cracking it. Carlson was not home during the rioting, but his wife, Susan Andrews, was. The conservative anchor was sitting at his desk Wednesday evening, less than two hours from his 8 p.m. show, when he started receiving frantic text messages about the mob, which Carlson’s wife thought was an home invasion. Fearing for her life, Andrews locked herself in the pantry in their kitchen and called 911. The couple have four children, none of whom were home at the time. “Tucker Carlson, we will fight! We know where you sleep at night!” the group chanted. The group of rioters also called Carlson a “racist scumbag” and told him to “leave town,” the place he has been since he was a child. Some also threatened to bring pipe bombs to his home. Self-righteous mob. An ugly phrase. An even uglier reality https://t.co/h4X4aONhRm. This is exactly what Democratic politicians and activists have been calling for. And yes, they are a mob, not protestors or activists. Carlson said he does not yet know for certain who is behind the attacks, but said he plans to find out.